Jacob Grimm (1785 - 1863) and Wilhem Grimm (1786 - 1859) are the famous German brothers who collaborated as authors, philologists, cultural researchers, and lexicographers to create the best-known folktales of the 19th century. Although classified as “Fairy Tales,” the stories collected here are not necessarily of a gentle nature and might not be a suitable for all children. That's why we've put together a Fairy Tales Guide with suggested stories for various ages. We recommend parents pre-read Grimm stories before sharing with children, just to be safe! Many of Grimm's stories are a fantastic fit for young children who are ready to embrace a bit more adventure, perfect for kids thrilled, rather than scared, when the bad tempered wolf with evil plans comes baring claws and teeth! Many of Grimm's scariest tales are best suited for 13 years to adult, such as The Girl Without Hands and The Juniper-Tree. If you are seeking Fairy Tales and Fables to read to young children that are more "unicorns and rainbows" than graphic adventure, visit the Children's Library and choose gentler selections. You may also enjoy satirical poems based on Grimm's stories by Guy Wetmore Carryl, including How Cinderella Disposed of Her Shoe. 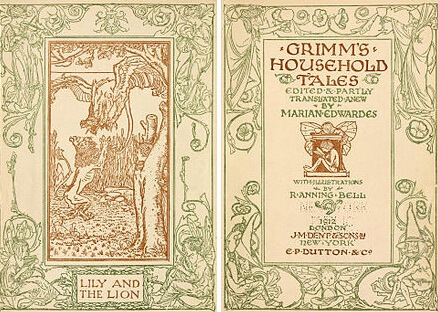 For the readers with a more academic interest in the collected works of Jacob and Wilhelm Grimm, you will find that these works are from the 1884 translation of “Household Tales” by Margaret Hunt and the 1912 edition, translated by Marian Edwardes. I do hope you will read these great fairy tales out loud to your children; they can be terribly thrilling and often lead to comforting question and answer sessions as kids wonder aloud about the things that scared and thrilled them. 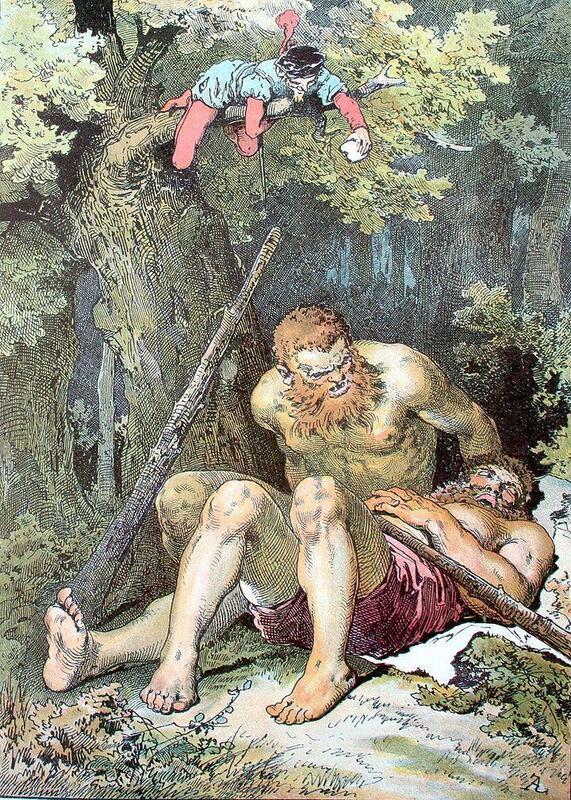 The picture below, with the little tailor perched precariously above giants, gives you a good idea of the situations that will be encountered as you read through these adventures tales. 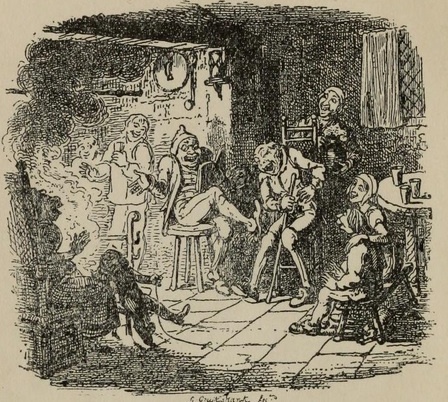 An illustration from The Brave Little Tailor by Jacob and Wilhelm Grimm.